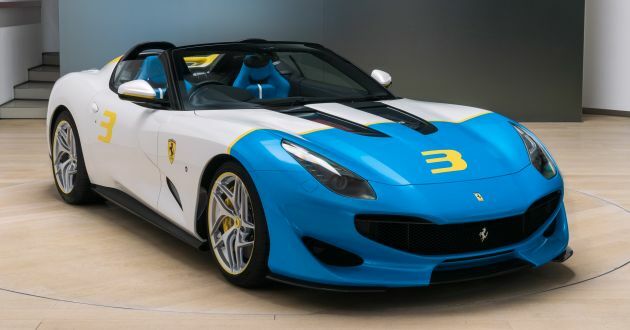 Ferrari has taken the wraps off its latest bespoke project, the SP3JC, which has been specially commissioned for one very important customer. The one-off model, which is built based on the limited-run F12tdf, is the result of an intensive two-year development between Ferrari’s Tailor-Made programme and the client. 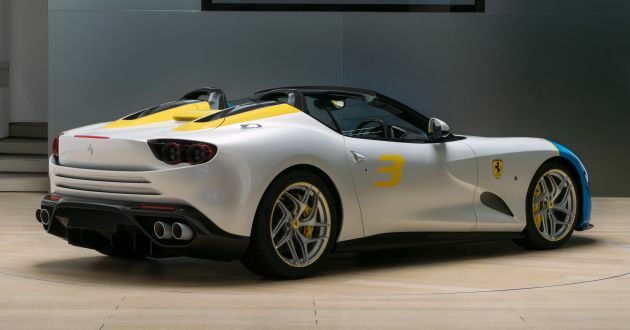 The SP3JC represents Ferrari’s “maximum expression of open-air motoring,” harking back to Ferrari’s illustrious V12 spiders of the 1950s and 1960s, as well as more modern models like the 550 Barchetta. It features a muscular stance with completely redesigned bodywork – the front apron looks tamer compared to the F12tdf, and the bonnet is new as well, with glass inserts for a quick peek into the engine bay. The rear-end is where the changes are more drastic. With the roof chopped off, two carbon-fibre roll-hoops take over to protect the driver and passenger. This connects to the iconic double bubble design that has defined many classic sports cars in years past, and channels rearward to meet the wholly-new rump. As you can tell, there’s clearly not a hint of the F12tdf left, save for the quad exhaust exits – this restructuring is accompanied by taillights inspired by the 812 Superfast. The unique paint scheme was inspired by the client’s passion for Pop Art. The base Bianco Italia (white) paint is met with Azzurro Met (blue) on the nose and Giallo Modena (yellow) highlights. This combination of colours also extends to the cabin, which is upholstered in blue and white leather. Under the bonnet is the same 6.3 litre naturally-aspirated V12 (long live the 12-potter), albeit tuned to produce 780 PS (10 PS more than the F12tdf) at 8,500 rpm (it revs all the way to 8,900 rpm!). However, no performance figures have been revealed as yet, and the V12 should still make 705 Nm of torque (same as F12tdf). Expect the SP3JC to match the F12tdf’s century sprint time of 2.9 seconds, and a top speed in excess of 340 km/h. Like what you see, folks?